DO YOU HAVE WHAT IT TAKES TO PLAY AND MANAGE A WORLD SERIES TEAM? You're go all the tools. Diving stops and leaping catches. Stolen bases and precision pickoffs. A pitching staff of junkballing lefties, flamethrowing righties, and crafty old relievers. But the key is to know when to use them, on any given day or play. You can tell a lot from your player's stats - the most detailed in video baseball history, from streaks and slumps right down to each player's biorhythms -- daily mood and physical condition. Beyond that, you have to rely on instinct alone. Because this is the "SECOND SEASON." When baseball becomes a thinking man's game, a war of nail-biting drama, strategy and nerves. When a world championship rides on every pitch, and one wrong move can end your season. From the first costly error to the last clutch hit, this is baseball at its very best. 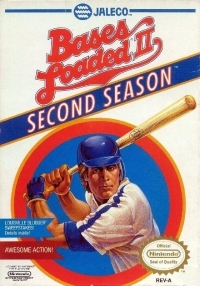 A big step up from the original "BASES LOADED"...and a world away from any other video baseball game! 07-21-2017 shepard11 Box Text Bases Loaded II Second Season DO YOU HAVE WHAT IT TAKES TO PLAY AND MANAGE A WORLD SERIES TEAM? You're go all the tools. Diving stops and leaping catches. Stolen bases and precision pickoffs. A pitching staff of junkballing lefties, flamethrowing righties, and crafty old relievers. But the key is to know when to use them, on any given day or play. You can tell a lot from your player's stats - the most detailed in video baseball history, from streaks and slumps right down to each player's biorhythms -- daily mood and physical condition. Beyond that, you have to rely on instinct alone. Because this is the "SECOND SEASON." When baseball becomes a thinking man's game, a war of nail-biting drama, strategy and nerves. When a world championship rides on every pitch, and one wrong move can end your season. From the first costly error to the last clutch hit, this is baseball at its very best. 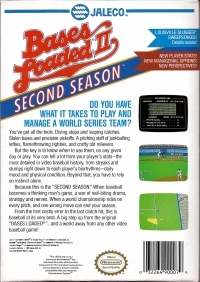 A big step up from the original "BASES LOADED"...and a world away from any other video baseball game! 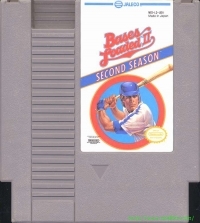 This is a list of VGCollect users who have Bases Loaded II: Second Season in their Collection. This is a list of VGCollect users who have Bases Loaded II: Second Season in their Sell List. This is a list of VGCollect users who have Bases Loaded II: Second Season in their Wish List.